In days of old, the male dominated academic world often viewed children's literature as inferior, in part because it was taught primarily in library science and education programs, and those fields were seen as belonging to women. Francelia Butler, a professor at the University of Connecticut from the mid-sixties to the early nineties, was instrumental in bringing children's literature into its own academic discipline. 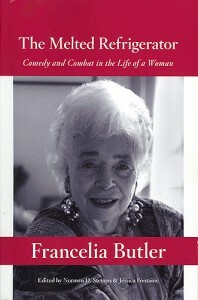 In addition to her many years of teaching, Butler founded Children’s Literature Journal, helped to form the children’s literature division of the Modern Language Association, and was a founding director of the Children's Literature Association, which appears to sponsor a Francelia Butler Lecture. She also began a festival that would eventually become Peace First. Additionally, Butler wrote 40 versions of her autobiography, The Melted Refrigerator. One of those versions has been edited by Norman Stevens, UConn Libraries Director Emeritus, and Jessica Fontaine, a Hollins University graduate student in children's literature. The Melted Refrigerator was released on April 28th, the 100th anniversary of Butler's birth. I have mentioned Francelia Butler here before. I didn't know her, but I did work in UConn's College of Extended and Continuing Education (which may not exist anymore) while she was still teaching in the regular academic program. I was there the semester she brought Margaret Hamilton to campus. I was aware of the great popularity of her children's literature course. I also picked up on some of the struggle she faced at various times. Several years ago, I stopped using the terms "kidlit" and "kiddie lit" in the text of my blog (It still appears in the masthead for the sake of continuity, but I'm wondering just how important that is.) because of Francelia Butler. A blogger friend pointed out the history of the term and how it was used to limit women and children's lit because children's lit was considered part of the world of women. This, of course, reminded me of my history walking the same campus Francelia Butler walked, at the same time, in fact, that she was walking it. Using the terms "kidlit" and "kiddie lit" is liking using the word "girl" for an adult woman. People who came before me worked hard so that I could be taken seriously. I shouldn't throw that away. Needless to say, I was very interested to hear about the publication of The Melted Refrigerator. Happy birthday, Professor Butler.